Google is changing how people switch between different user profiles and also moving guest mode from a hidden feature to a regular part of the browser, at least in beta. The latest beta build of Chrome moves user profiles from the upper left-hand corner of the browser to the right-hand side next to the minimize, maximize and close buttons. 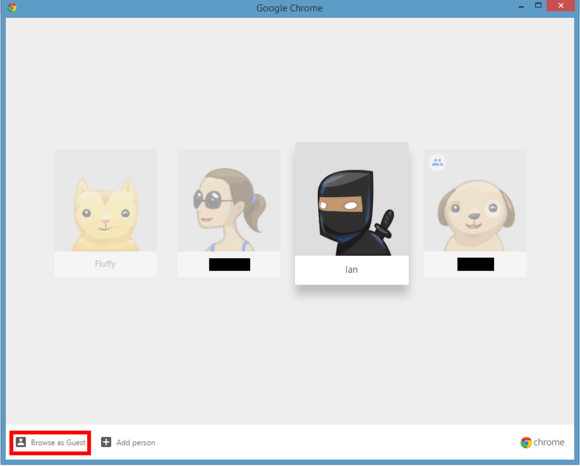 User profiles are designed to personalize your Chrome experience even if you're on a shared PC. Each profile contains a different set of browser cookies, logins, extensions and apps, browsing history, and bookmarks. Google moved the profile switching option from one side of the browser to the other. With the new look, instead of seeing your user icon in the menu bar—such as a ninja, horse, or puppy—you just see your name. Click on your name and a drop-down window appears with your user icon, as well as the option to switch between users or open an incognito window. The new profile change is actually more than just a placement switch and UI redesign. It's a completely new sign-in mechanism that operates separately from the browser. With the change, Google is again giving Chrome an OS-like feel on Windows and other platforms. The tag line for the new Chrome profile switcher is "This is your Chrome." 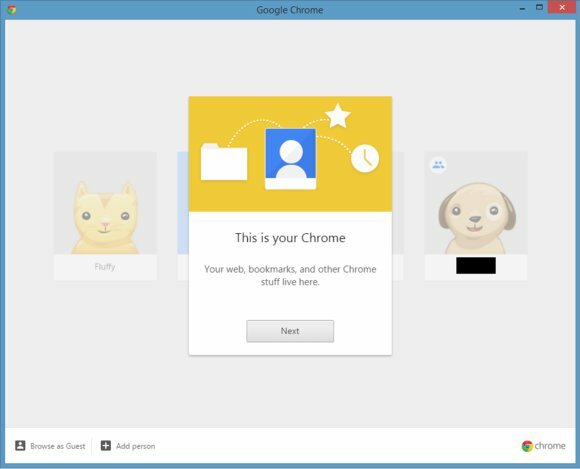 The campaign is focused on highlighting largely pre-existing, but previously obscure, personalization features for Chrome on a shared PC. 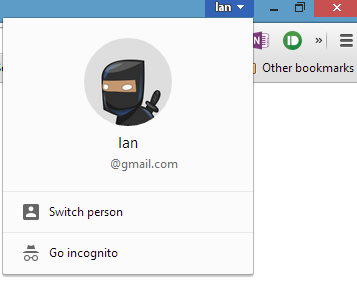 Chrome beta's new profile switching window that includes guest profile option. When you want to switch to a new user profile, click on Switch Person from the drop-down menu and a new window appears with all the different user profiles saved on that PC. Switching users, just like before, requires you to click on the profile you want. Chrome then opens a separate window with the new user profile. Other profiles that were open will remain untouched. The profile switching window is also where you can add a new profile to Chrome or switch to guest mode by clicking on Browse as Guest. A guest profile doesn't save any browsing information, immediately deleting logins and other data once the session is closed. Guest mode is a great way to let visitors use your PC without giving them access to your personal browsing information and logins. However, guests can easily switch to other profiles, meaning that to truly stop someone from checking out your open tabs, bookmarks, and saved logins you'd have to sign out of the browser completely. There doesn't yet appear to be a way to password protect your session from other users on the same PC. Guest logins have actually been around for a few months. The current version of Chrome hides guest logins under a special flag. To try out the feature right now check out our tutorial "How to use Google Chrome's secret guest profile feature" from February. In addition to rolling out guest profiles and a new profile switching mechanism, Google released a beta version of 64-bit Chrome for Mac. The new 64-bit build follows the stable release of 64-bit Chrome for Windows. Google says the 64-bit upgrade allows it to make a number of speed and security improvements to the OS X version of Chrome. Unlike the Windows world that still includes a huge number of XP users on 32-bit machines, nearly every Mac user should be able to run 64-bit Chrome save first-generation Intel Macs.